A stroller that offers many incredible combinations! The Duette Piroet is extremely agile, with easy to use swivel front wheels, and allows mobility through most narrow places. It is travel system compatible with two Primo Viaggio car seats--without the need for adapters, and has an extra-large basket that holds all of the necessities for two. With the Duette Piroet, two children can travel in comfort and style -- however they please. The adjustable seats included with the Piroet can be configured to face the parent, the world or each other. The chassis also accepts two Primo Viaggio infant car seats, without the need for adapters. In the event parent would like to travel with two Pop-Up Bassinets, an adapter is available (sold as an accessory) to allow both bassinets to fit on the chassis. The Duette Piroet is equipped with two front swivel wheels and a single handle that helps maneuver the in-line double through tight spaces. Each wheel is made of polyurethane with tread and contains ball bearings and suspension, which allow for 360 degree agility and less effort in pushing. A centrally controlled braking system located on the rear wheels makes stopping and parking easy. Each seat included with the Duette Piroet contains a large, adjustable hood with a mesh ventilation system. The footrests of the seats can be adjusted and the backrests can recline to suit the comfort level of each child. An extra large basket is available to store all of the necessities for two children, plus parents. 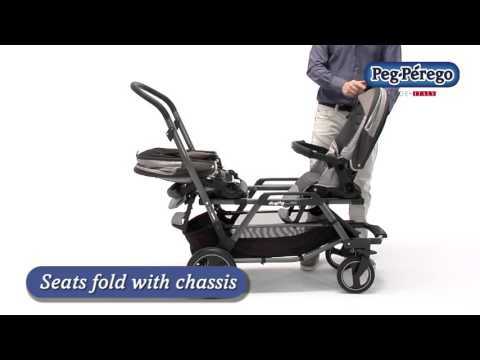 Travel System Travel system-compatible with Primo Viaggio car seats; accepts two car seats directly on to chassis without the need for adapters. Adjustable Seats Seats have reclining backrests, two-position footrests and can fold compactly.